The Healthy Brain Fair was created to increase awareness in the local community about memory loss and the importance of being screened for it early and often. The fair also featured guest speakers who spoke on subjects pertinent to seniors. Teryn Clarke, M.D. discussed overmedication and its effects on seniors. Nora Escobedo, from the Family Caregiver Resource Center, hosted a fall prevention workshop. Cheryl Alvarez, Psy.D discussed memory loss and its symptoms. All three speakers presented to capacity crowds in AFC’s program room. In addition, Silverado Memory Care Community offered a Virtual Dementia Tour. For seven minutes, participants experienced the life of a person with dementia through virtual reality goggles. AFC also debuted its free memory screening program, where attendees participated in 15-minute memory screenings with qualified professionals. AFC will begin holding free memory screenings on a monthly basis beginning in January 2018. AFC would like to thank its title sponsors, the Huntington Beach Council on Aging and Scan Foundation for sponsoring this first-time event. AFC would like to also thank the Fair’s additional sponsors, Orange County Caregiver Resource Center and the Alzheimer’s Association, and Merrill Gardens for offering a complimentary healthy lunch for guests. 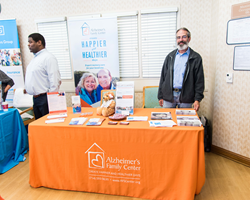 To learn more about Alzheimer's Family Center, please visit our website.